What Are 3 Disadvantages of Being an Only Child? Birth order is thought to influence personality traits. 2 What Are 3 Disadvantages of Being an Only Child? If you're the oldest, you're responsible and bossy; if you're the youngest, you're creative and a free spirit. Middle child? You're the peacemaker. If any of this hits the mark, it's because where you fall in the order of your siblings may be more predictive of your personality than many other factors, according to experts. While the sequence of birth is not the only determinant, there is some evidence that it contributes to certain personality traits. 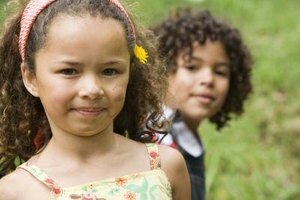 Understanding the developmental factors associated with your position among your siblings can offer some insight into why certain traits develop. The first born child in a family may be expected to show maturity or pose as a role model for younger brothers or sisters. This tends to make older children good leaders. According to a 2006 study conducted by Emma Beck and published in the Journal of Personality and Individual differences, older siblings tend to be more dominant than their younger siblings. Other traits that are commonly associated with this sibling position include confidence, determination and conscientiousness. It is common for the middle child to not get as much attention as older and younger siblings. This tends to make individuals at this position more independent, empathetic and patient. Being born in the middle is also associated with the ability to get along well with many different personality types and to adapt to situations. This is primarily the result of having to deal with both younger and older siblings. Parents typically do not have to depend on the youngest child to be responsible for older siblings. It is also common for the last born to be cared for by the older children. According to Judith Graham, a human development specialist for the University of Maine, this and other factors tend to result in the youngest child being uncomplicated, carefree, attention-seeking, impatient and rebellious. Last born children also tend to have many friends and be class clowns. While only children do not have siblings, their position also influences personality traits. Only children share some characteristics with last borns. Similar to oldest children, they are often mature and responsible. They typically receive a lot of attention from their parents and expect the same level of attention from others. Only children also tend to be strong-willed, private, self-critical and ambitions. They may feel uncomfortable with conflict due to not having brothers and sisters. West Virginia University Extension Service: Does Birth Order Really Matter? What Are the Advantages of Being the Youngest Sibling?